Create, Share and Publish eBooks on the iPad! You read that headline right! There is now an app that allows for full text/image layout of eBooks on the iPad. When your all done, you can save it as a ePub. An industry standard electronic reader standard, which means it can be read by the iBooks app as well as many other eBook readers. We had to push out the above bit of text quickly, right at the beginning, because we are very excited Book Creator for iPad. Not since our Newton days have we had a full power eBook creator so easy to use and creating a standardized document at the end on our little handhelds! Book Creator for iPad is an iPad only app, but the eBooks you create can be read across many reader screen sizes so if your serious about publishing your works, keep that in mind. If you are like us, you have a few fun book ideas floating around in your head. All it takes is time to sit down at the computer and get started. We usually type on our iPads on the go with our text editors then add that text to the book when we hit the office computer. 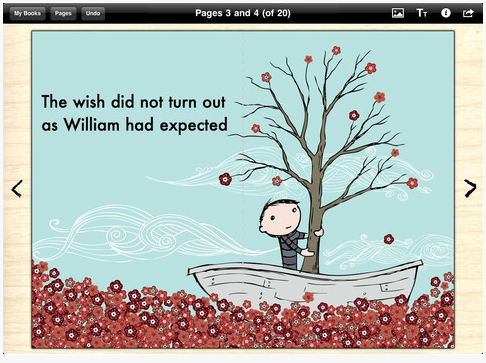 Now with Book Creator for iPad, we are creating the final product any time we want to. This will lower the amount of time we spend with minor edits at the last second as we find text now flowing correctly on the page, we are doing it in real time! The developers of Book Creator has the final ePub document at Apple’s standard to sell through iBooks. This means it is iPad to income (your mileage may vary… please keep ‘quality of content’ in mind!). Or, if your putting a proposal together, why not create a ‘book’ out of it. We used to walk into presentations with a bound document for everyone to flip through and take with them, now it can be an eBook. There is no security, more commonly referred to as DRM, so keep in mind your creations can be read by anyone who has possession of it. That’s it for now, we’ll put up some links to our creations as they wrap up… off to layout a kids picture book, then maybe mom’s recipes.